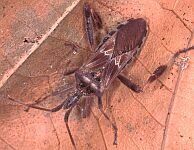 Bugs can be separated from beetles and other insect orders by their overlapping fore-wings, piercing/sucking mouth parts and simple metamorphosis. Each fore-wing is typically thick at the base but thin and membranous at the tip. The wing tips are typically folded so that an X or inverted V pattern appears on the back. The mouthparts form an elongated beak which is used like a hypodermic needle. 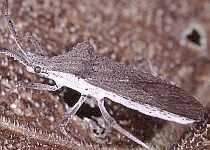 Immature bugs do not pass through a pupal stage and look much like smaller versions of the adults with stubby wings. Slater, J. A. & Baranowski, R. M. 1978. How to know the True Bugs. 256 pages. Wm. C. Brown, Dubuque, Iowa. 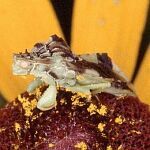 This predaceous Minute Pirate Bug, Orius cf. insidiosus, (Anthocoridae), has become a victum of a small flower spider. Although all insects are "bugs" to most people, the insects belonging to the order Hemiptera (meaning half-winged) are the "true" bugs of the insect world. Bugs are one of the larger insect orders with a wide variety of terrestrial and aquatic species, plant feeders and predators. There are likely a few hundred species in the Windsor region. These true bugs attract a lot of attention at Ojibway. Some are rare/unique inhabitants of the prairie and savanna, others are brightly coloured or have fascinating habits, and a few regularly enter households. Some bugs have powerful chemical defenses. 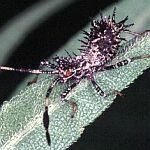 When threatened, many stink bugs produce a strong foulsmelling chemical to discourage predators. 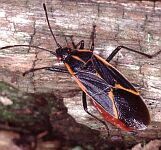 Milkweed bugs have bright orange and black colours. These colours are a warning to predators that the bug contains milkweed toxins and is poisonous. The Small Milkweed Bug, Lygaeus kalmii (Lygaeidae), is common at Ojibway while the Large Milkweed Bug, Onocopeltus fasciatus (Lygaeidae), is scarce. 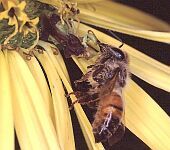 The majority of bugs use their hypodermic needle-like mouthparts to extract fluids from plant foliage or seeds. The rich and diverse plant life at Ojibway supports a wide range of bugs including some species rarely found elswhere in Ontario.The spiny nymph of the euphorbia bug, Chariesterus antennator (Coreidae), can be found in the prairie near its food plant, flowering spurge (Euphorbia corollata). Some bugs have modified fore legs for grasping and restraining prey. Ambush bugs, Phymata sp. (Phymatidae), regularly catch bees, flies and butterflies much larger than themselves. They are often found hiding in the flowers of black-eyed susans, sunflowers and goldenrods where they wait to "ambush" their prey. 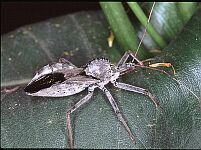 The large Wheel Bug, Arilus cristatus (Reduviidae), feeds on caterpillars and other insects. This impressive bug is not often seen in Ontario. Its common name is derived from the distinctive curved hump on the prothorax decorated with coglike teeth. In the early summer people often find Masked Hunters, Reduvius personatus (Reduviidae), in their homes. This introduced bug is typically found in homes and other man-made structures where they feed on other insects. Handle them carefully since they can inflict a painful bite. In the fall Western Conifer Seed (or Pine Seed) Bugs, Leptoglossus occidentalis (Coreidae), enter homes in search of hibernation sites. This brown bug is about 16-18 mm (3/4 inch) in length with noticably flattened hind legs. It was once restricted to western North America but has steadily spread eastward, reaching Ontario about 1985. Adults and nymphs feed on the developing cones of a wide variety of conifers such as pine trees. In the fall adults concentrate on the sunny side of buildings and a few enter homes in search of hibernation sites. The Boxelder Bug, Leptocoris trivittata (Rhopalidae), is often found in Windsor near its favorite food plant, Manitoba Maple. Masses of female bugs can sometimes be found in sheltered spots on the sides of buildings in October. These last two species are not a cause for concern by home owners. They do not bite, feed or reproduce indoors. Many of our most conspicuous and widespread aquatic insects are true bugs such as water striders, backswimmers, water boatmen, giant water bugs and water scorpions. All but the water boatmen are predators of other pond life. Unlike many other aquatic insects, bugs do not have gills. Water scorpions breathe through a long tube while others carry an air supply on the underside of their bodies when they dive below the surface. Copyright © 2001-2005. All rights reserved. You are on the City of Windsor World Wide Web Site.